What's the hold up on the Armory property? Word on the street today has Scott Lieb and associates vying to develop the property with a combination commercial/residential project. Perhaps that was the reference by Nostalgic Gal that Scott had a conflict of interest and withdrew from attending one of the meetings mentioned by NG. What’s the good word, Scott? what's going on???? 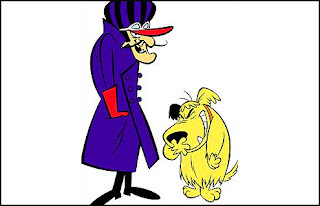 presto....chango..........who who who whadda???? on the way to Seussical! Another issue that I have found is being a pedestrian. This does not mean run over me or others. I always stop for them, granted there are some that are not paying attention or simply careless. I was crossing the street on Monday after having had some divine cherry vanilla ice cream from Abigails (becoming a fam tradition where we all walk down and get some ice cream and sit on the diamond watching the cars go by) when I waited and waited because noone would stop for me. Finally there was a break and I headed out IN THE CROSSWALK when this lady gasses it and I'm stuck in the middle of the crosswalk with her stopped tailing this car that is abiding traffic. I threw up my hands like what the heck because at that point I was semi concerned for my safety and she mouthed and I could hear her say what do you want me to do, UH for starters let pedestrians CROSS when they are abiding the crosswalk sections. When one is in them do not gas your vehicle to get there first and put their safety in danger. I have seen numerous people about get clipped. My mother had a similar situation with some old bitty in a big cadillac style car tell her while she was in the crosswalk you better run. What the heck is wrong with some of these people. 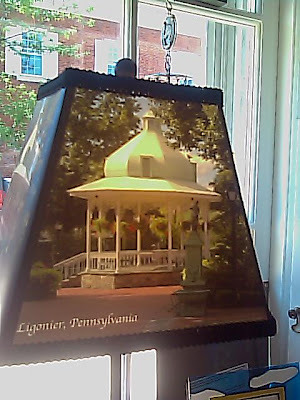 I speak as a Ligonier native, but imagine how this looks to tourists and visitors?! I know Mr. Mayor I've seen you about get clipped too. I really have a concern for this because we have the signs and the crosswalk marks, but seems to do no good as people do not care. This is more than a rant, it is a concern for safety. Give me a badge and I'll sit out there and patrol. I mean it! In the past week I've seen 4 count them 4!!! vehicles go the wrong way around the diamond! Kinda scary. I realize we have signs but god love people they just don't read them! I don't know what else could be done. I just ran out because I heard some manly voice yell and saw the car travelling fast the WRONG way! 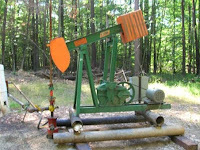 We were greeted one day by a HUGE cement mixer (industrial size) coming at us the wrong way. Yikes! .....can take some time. Frankly, I still haven't made it to all of our little shops. With most being closed in the evening and on Sundays, worker bees like me have a hard time of it. Once in awhile I get to escape the office during a weekday and jump into a shop for a quick buy. That doesn't give me window shopping time and so money stays in my purse but there's a lesson in here somewhere for merchants. We have a whole demographic of worker bees in town who might spend a nickel or two or three if shops in town stayed open in the evening or even on Sundays. I know, it's a chicken and the egg kinda thing. You don't want to stay open because it's not worth it but it will never be worth it until shops stay open enough for people to figure it out and change their habits. So often I see people walking around town at night, frustrated and looking in windows wishing there was something to do, somewhere to spend some money. I have run up the street countless times hoping to beat the clock and get cigars or coffee or food, only to find a locked door. I noticed recently, maybe it was last Sunday, that Equine Chic was open at an odd hour and it was so exciting! It made that corner of the Diamond seem so alive and there were people inside and outside of the store. So many gripe that big chains take business away from small shops but the reality is that Giant Eagle and Dollar General understand shopping habits and they stay open to cater to the needs of their consumers. If you are paying attention to my office, you'll see people working at all sorts of odd hours. Though the front door may be locked after 5pm, we're still working. 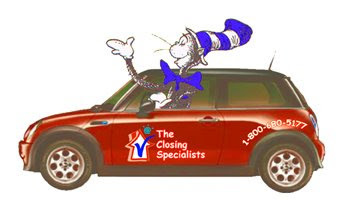 We do closings 8 to 8, Monday thru Friday and 10 to 5 on Saturday. If you lead with accommodating the needs of the consumer, they will eventually find you and take advantage of your goods and services. 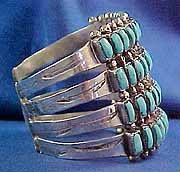 Okay, what you don't know if that this post started as a way to say I really think you should stop by the Indian Jewelry Store cause they have all sorts on interesting things. LOL I know.......but seriously, it's one of those stores here in Ligonier that is a really fun browse. We offer everything from Native American pottery, Kachina dolls, and Navajo rugs to Sweetgrass incense, herbal tea, and Masterworks pewter. In additiona, our selection of Zuni furniture, nature still-lifes, tribal music CDs (including flute, cittern, and the mountain dulcimer), wildlife art brought to life on hand-cut, hardwood burls, make American Indian Jewelry an adventure to visit. .......of Darlington, Ligonier Township, died Monday, July 28, 2008, after a lifetime battle with multiple heart defects. Friends will be received from 2 to 5 and 6 to 8 p.m. today at the J. Paul McCracken Funeral Chapel and Crematory, 144 E. Main St., Ligonier. A blessing service will be held at 10:30 a.m. Friday in the funeral chapel followed by a Mass at 11 a.m. at Holy Trinity Catholic Church. Private interment will be Saturday at Calvary Cemetery in Port Vue. Sounds like this young lady cherished every moment of life. Deepest sympathy to her family and friends. Sorry for being MIA lately. Love has struck this Liggygirl :-p not to mention been working more and finishing up the darn (insert expletive) research paper is taking all my time. I'd rather be cleaning. You know it's that bad hehe. Oh side note my love is originally from here :-D hehe What happens in Ligonier stays in Ligonier, jk. Miss you all! Diane's keeping it going strong :) YAY! Good job Mrs. Mayor! 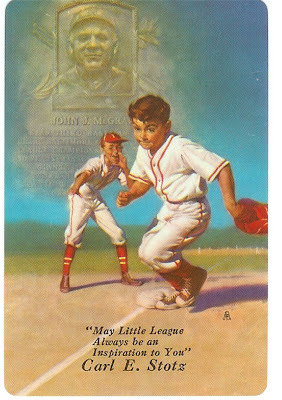 What a tremendous run our Ligonier Little League team had! reservation web page? It's the Taffetas! Well, it's three of our gals. What a great show that was. 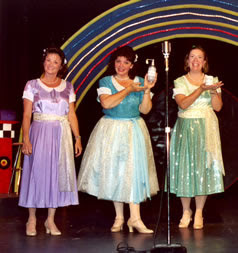 In case you don't remember, that's Janet Beattie [now Janet Formato], Cathi Rhodes, and Diane Winogrodzki. Love Seussical. Hope you'll forgive oversight. Saw this in a Google alert......bluegrass musician reading today? Kickoff Camp opens for all players today when they must report and take their annual run test this afternoon. A roster of 81 players is expected . The Steelers have one International roster exemption for England native Marvin Allen, who will spend his second season on their practice squad. The roster includes 54 veterans, 7 first-year players and 19 rookies. 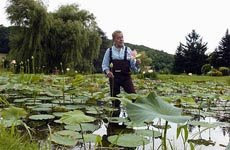 Ancient Manchurian lotuses will be blooming along with hundreds of water lilies at the annual Celebrate the Lotus luncheon next Saturday in Ligonier. The annual fundraiser for the Westmoreland Museum of American Art will be held from 1 to 3 p.m. at the summer home of florists George Griffith and Thomas O'Brien. Tickets cost $75 per person and include a light luncheon. Artist Ron Donoughe will be on hand to paint flowers in and around 33 ponds on the 60-acre property. For reservations, call Laura at 724-837-1500, ext. 33, or visit www.wmuseumaa.org. 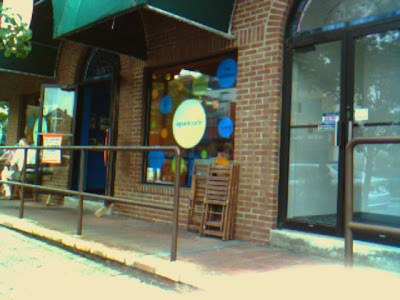 ...the Square Cafe in Regent Square, near Pittsburgh. 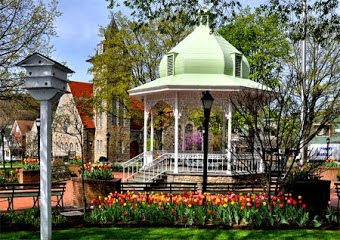 As Pittsburgh area neighborhoods go, Regent Square can be compared to the Ligonier Diamond district. Yes, it's more urban but pedestrian traffic is comparable. It's a nice mix of neighborhood families and visitors. The Square Cafe is a destination place for me. When I'm in town visiting friends and family in the morning or afternoon, I will drive a few miles to get to this little cafe. Why? The food and service are tops, it's always clean and I love to eat outside on the sidewalk - literally right next to the parked cars. Dogs are welcome and the servers will bring a nice large bowl of water to your table for canine friends. Notice how small the tables and chairs are? Notice that they are fairly light and easy to fold? 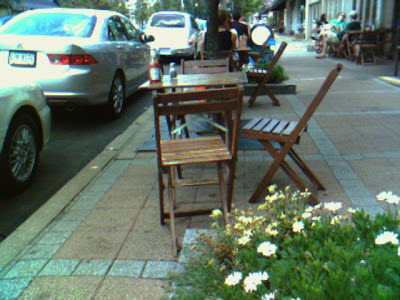 See how some tables are right up against the building and some are between the sidewalk and the parked cars? Pedestrians stroll through diners and nobody cares. You can't just walk up and sit down. You must see the hostess for indoor and outdoor seating, but it's all very casual. 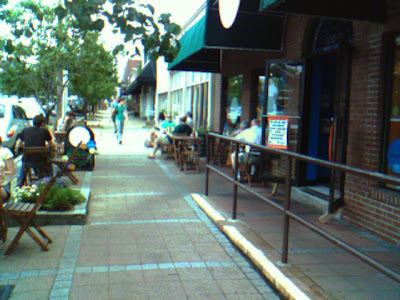 I highly recommend that restaurant owners on Main Street who are thinking of outside seating, visit this place. Here's their web site. I also recommend that borough planners might want to stop by some Saturday or Sunday morning and see how very enjoyable this type of outdoor cafe can be. No need to build anything. It's quality and it's so simple. 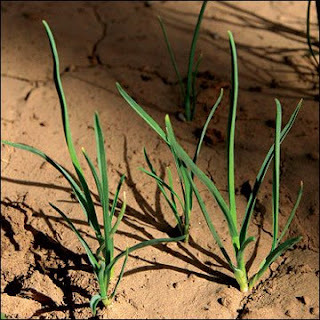 Wait till you see what these two look like now! Tina Sykes - my favorite reporter - was out last night taking pictures. 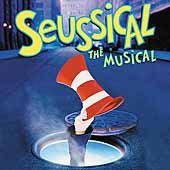 You'll see the REAL Cat in the Hat and Jojo in the Ligonier Echo. 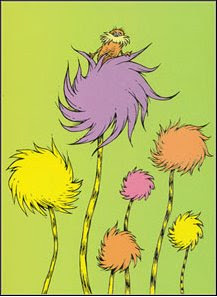 I just saw a lady walking along the sidewalk with a fluffy poofy thing that floats in the air (you all know I mean) and I thought how much do you wanna bet that is whoville?!! 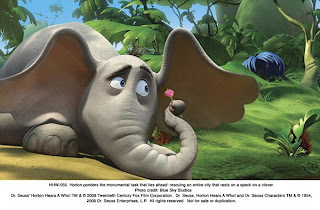 Where's Horton to interpret. Just wanted to let everyone know that if they haven't had a chance to visit the magnificent exhibit on the Titanic being displayed at the Carnegie Science Center in Pittsburgh, the Ligonier Valley Library is hosting a bus trip to the exhibit on Tuesday, August 26th. 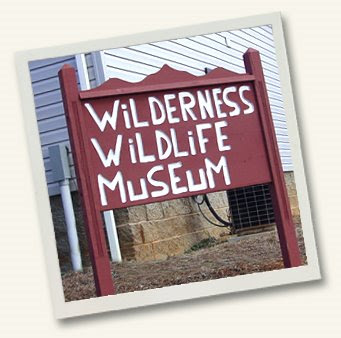 The cost is $52.00 per person and includes bus transportation, exhibit admission fees and lunch at the Pines Tavern in Gibsonia. 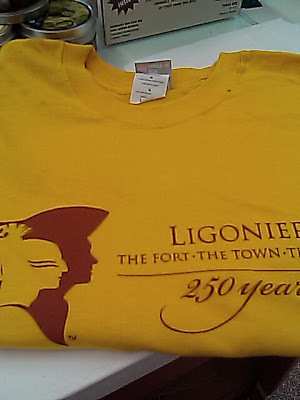 Call the library for details (724-238-6451) or visit their website at www.ligonierlibrary.org. Space is limited. A bit of history in our own back yard! OK so you MUST book your calendars on Aug. 19 11-4pm or Aug. 20 1-5pm to see Dr. Kinorea "Two Feather" Tigri at our Compass Inn (3 miles east of Ligonier) Route 30 in Laughlinton....can't miss it. Anyway Dr. Tigri is a Cultural Practioner and will present the hisory of the Wampum and different skills and trades that they did. Admission is $9 adults, $8 seniors, $6 students, under 5 FREE. Go check it out and may I remind you to simply visit Compass Inn and take a tour, see carpenter, blacksmith, bobbin lace demonstrations, cooking, quilting, weaving, games and more LIVE! 724 238 4983 to contact the Inn. 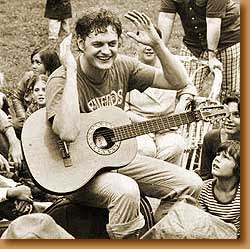 Harry Chapin....music to remember well. The Valley Players of Ligonier will sponsor a concert, "Remembering Harry Chapin," a tribute to the late singer-songwriter, at 7 p.m. Saturday at Ligonier Theater. The cost is $12. 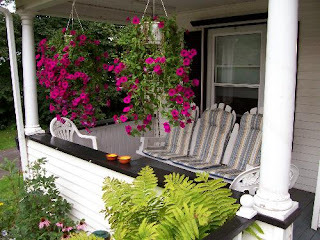 Call 724-238-6514.
just how important is the front porch? 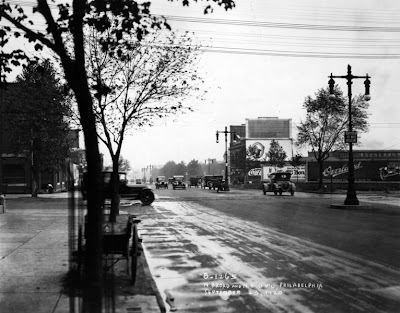 Do many neighborhoods have that kind of rapport anymore? As our culture has grown more suburban, it seems to have moved to the back yard. House hunting, we looked at plenty of cul de sac neighborhoods with beautiful new homes. Almost every one had a deck in the back yard; few had a real front porch. Obviously, the backyard lifestyle is a sign of our hectic lives, of our craving for peace and solitude and privacy. And I’m sure there’s plenty of back deck mingling between neighbors who choose each other. But back deck living also seems to be a turning away from the heart of a neighborhood, a retreat from the life of a place. Well something that gets me is all this talk over housing. Granted I may be young, but I have history in this valley, and much more than some. To some that might make no difference, but for myself it does. I pride myself on this town. I have grown up hearing stories of town and how family has watched people come in and think they are big wigs and try to change things. I am always skeptical of people that think they "know" Ligonier and try to make it something that it is not. I have heard my mum talk about how Ligonier has the right set up with shops and then apartments above for housing. Forgive my lack of recalling (may not have paid attention) but I think there is alot to be learned from this and the studies that other towns have not maintained this and then contractors have nothing but praise for the few and far between towns that are set up as ours is. What better way is there to celebrate summer than to hike the entire Lincoln Highway (route 30 through Pennsylvania), which extends from New York City to San Francisco. Or maybe we have only 10 who give a hoot about their prime rib or maybe they like it anyway they can get it? Well, there's a big 8 days left to vote so don't fall all over yourselves clicking or anything. Frankly, in a town that has no problem with controversy, I think we're all just too nice to take sides when it comes to food. ever wonder what a Truffulla tree looks like? Board members Kevin McLaughlin and Kevin Pahach voted against hiring InShore because no other companies were invited to submit proposals before InShore was chosen. Cast of Seussical.....do you see someone here you know? 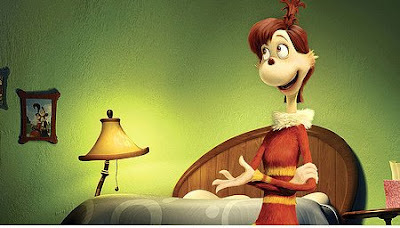 Mrs. Mayor of Whoville...who is she, really? My basement is filled with the sound of Whos - much to hubby's loving chagrin, but from his perspective, I have to assume it is oh so much better than the aria incident or shall I say, fundraiser. ;) At any rate, I am still working on finding my character, my version of Mrs. Mayor. I don't like to mimic the Broadway performance, I'd much rather interpret the material and find her myself...............I know she's in there and she's just bursting to come out. Frankly, I think she's a wild and crazy but loving kinda mother who. 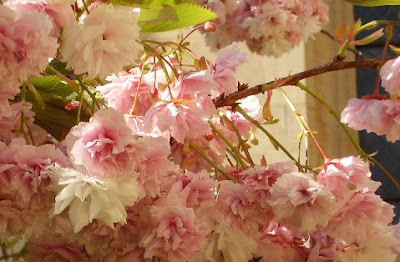 It may take full make-up and costume for a full blossom or maybe just looking into the eyes of all the little whos. This is going to be such a fun show. I do hope to see you there. 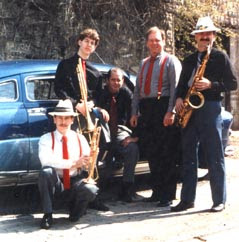 Interesting, their web site says..."this traditional Jazz Band is sprinkled with the steaming sounds of Cajun and Zulu music." Hmmmmm.....steaming. Hmmm.....Zulu. Hubby and I finally got into the Main Street Cafe and had some gelato. I know. It's criminal that it's taken us this long. It's that goofy West Main - East Main thingy at lunch. I'm looking at everything in Ligonier with new eyes now that the diner is closed. It was just so easy to say meet you at Erin's. Yes, we still called it Erin's even though it was the Fairfield Grille for 7 years. So, here's my impression of the Main Street Cafe which is on East Main Street across from the Nearly New and Underneath shops. I like it! I like it alot. They have freshly made deli sandwiches and a few salads and wedding soup. They have gourmet coffees and espresso, but the REAL draw is the gelato. 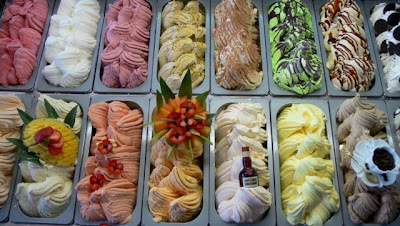 Do NOT miss trying the gelato. I intend to try every flavor. The small serving is HUGE. Don't let the little cup fool you. The deli is clean and the service was fast and friendly. The sandwiches are a bit pricey but worth it for what you are getting. They're big and fresh. They have seating inside or out. Here's a link to the schedule. If we had our old Ligonier Echo, we'd have a clue. Here we sit clueless and have you noticed the absolute lack of news on the Armory property? Bradley Coleman picked up the victory and had two singles, and Ligonier cruised to a victory in the 11-12 division Section 2 tournament in Connellsville. Kolby Luttner and Alex Tutino each had two singles for Ligonier, who must now defeat Moon at 7 p.m. tonight to advance in the tournament. cleaning carpets or stealing drugs?? LIGONIER, Pa.—State police are looking for a fast-talking man who invaded an elderly Ligonier woman's home and stole prescription drugs from her medicine cabinet. So there was a convention for these darlings at seven springs... The friendliest of people and the one set from ontario. He said what a lovely town we have here :-D I couldn't agree more! Mike and cathy finch own the blue one... If ur interested email is finch13@sympatico.ca very cool bonus for our town today. I keep looking out the store door and much to my happiness the MGs keep multiplying. 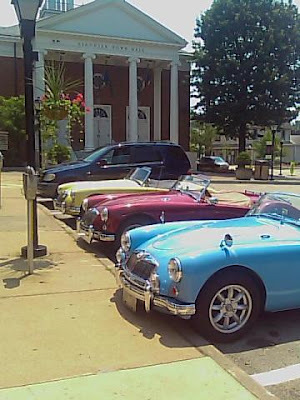 Really the pic does no justice to their colors....amazing cars. Do you know anything about this gas station, anybody? 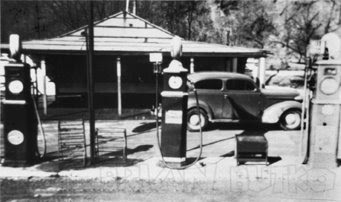 Lincoln Highway News Blog is reporting that this gas station was on the Sleepy Hollow site and burned down in the 1920s..... hmmmm. 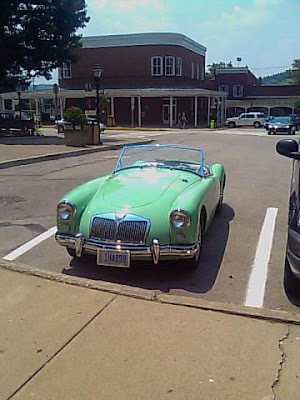 There I am in a lovely MG car that a fabulous couple said to hop in for a pic. Ill put that on my goal list. last call for pet pics! The Preview Party will be held from 6:00 to 8:00 p.m. on Friday, August 22. Tickets are $20 per person at the door, $15 per person if paid by August 16. Checks are to be made payable to Ligonier Valley Library. This year's book sale is a little different from previous years, as only bargain books will be available in the basement. Also, participants in this year's Annual Book Sale Preview Party, "Odds & Ends," will have the unique opportunity to go home with a bag of books. Only during the Preview Party ... Fill a bag for a Buck! Re-Readables Bookstore* will be open during the party. However, the items found in the bookstore are not included in the "Fill a Bag for a Buck" offer. All items in the bookstore are marked with a price inside the cover. the chance to fill up on delicious hor d'oevures, drink some wine and enjoy the company of other book lovers! The Summer in Ligonier arts and crafts show will be 9 a.m. to 5 p.m. July 25 and 26 on the Ligonier Diamond and surrounding streets. Paintings, wooden country items, stained glass, jewelry and pottery will be among the wares featured during the quality arts and crafts show. Merchants will have sidewalk sales. The Popcorn Man, Dave the Balloonatic and Face Painting by Tony will be on the scene both days. This is what ill be giving as christmas presents this year...lamp shade is 125 bucks and base is 36. The first in a series. 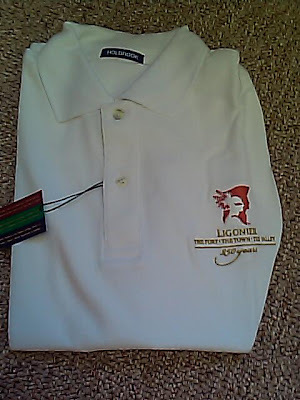 Great souvenir of ligonier. All are numbered. We have a new shipment of shirt and sizes and a new color gold. There also yellow and white polo shirts. Hats are on their way. Hey, just for kicks let's take a prime rib poll! Look on over at the right side of the screen. See that voting poll over there? If you like prime rib and have a favorite, let us know. I find it really interesting that we have so many weekly prime rib specials here in the Ligonier Valley. It's something when one of Ligonier's own oldies but goodies people die. I was blessed to have met Clyde V. Giesey through dating his grandson. We were together almost three years, but grew apart. I got to get acquainted with Clyde through family functions, holidays, and just going to the house all the time. He was a great guy with a heart of pure gold. There are many stories I have in that short amount of time, but almost all of them are humorous, if not semi hilarious. Clyde liked almost everyone and anyone, he saw the good in people. Sometimes even people that one would think wow, that's not a good person. If he didn't like someone, you knew there was a good reason. He was a hard worker and loved to make work a hobby. I remember when he became ill and it tore him up not getting to go to work regularly, if at all. He always went to the "office" for paperwork or to see the "girls" at Bulls. Anyone that goes there would know Clyde as a staple there, he has his own chair and own corner. He was a frugal minded man, but a generous one at that. I attended a birthday party of his at the Harbor and I found it interesting that who he invited he paid for the whole meal, he simply wanted the company. There are many things that we won't really know that he did out of the goodness of his heart. I do know that he was well loved by many in this town. He is with his maker, but we will greatly miss him. line dancing...come on, you KNOW you love to boogie! PJ & Maggie are hosting a fun night of line dancing at the Ligonier Country Inn this Friday night with music by the Mountain Boys. 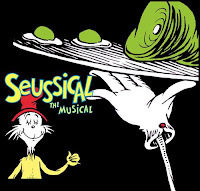 Seussical is just about the most organized and thoroughly pleasant community theater project I have experienced. Sandy Vansuch, Executive Director, is a pro. [Here's a big thank you to the board of directors for hiring and supporting Sandy.] She's teaching us theater, real theater, at every rehearsal. She has taken a very large cast, including children and just brought out the best in everyone. The kids are hilarious and doing such a great job. We wade through feathers - boy there are lots of fun feathers in this show - and have loads of fun. Veteran Valley Players will understand when I say the cast is practically "off book" and we are three weeks before the first performance. We are running the show from start to finish and we haven't yet had our first rehearsal with the music director who meets with us for the first time this week. How can we be so far ahead without the musical director? Sandy arranged for us to have computerized accompaniment. It's amazing! She's amazing. The set has been magically growing every day and the entire show is blocked. This is just a wonderful experience. We now have three solid weeks to polish the act. Call the Valley Players now to make reservations. This theater is alive with joyful talent and fun. Take a break and visit the world of Seuss. I can't wait. Cathi, if you are reading, would you share the song list? 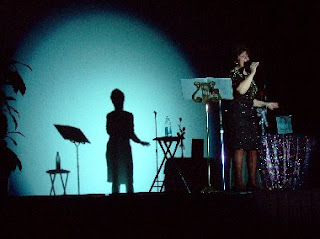 You can visit Cathi's web site here and leave your e-mail address. She'll let you know when they are available. I'm hoping she might have some for sale at the Ligonier Theater.